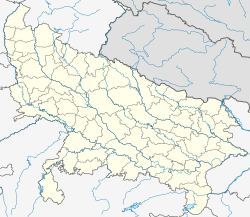 Meerut ( pronunciation (help·info)) is a ceety in the Indie state o Uttar Pradesh. It is an auncient ceety wi settlements datin back tae the Indus Valley ceevilisation haein been foond in an aroond the aurie. The ceety lees 70 km (43 mi) northeast o the naitional caipital New Delhi, an 453 km (281 mi) northwast o the state caipital Lucknow. ↑ "Cities having population 1 lakh and above, Provisional Population Totals, Census of India 2011" (pdf). Office of the Registrar General and Census Commissioner, Ministry of Home Affairs, Government of India. Retrieved 25 August 2013. ↑ "Urban Agglomerations/Cities having population 1 lakh and above, Provisional Population Totals, Census of India 2011" (pdf). Office of the Registrar General and Census Commissioner, Ministry of Home Affairs, Government of India. Retrieved 25 August 2013. ↑ "Chapter 3 – Findings: Metro Cities of India" (pdf). Central Pollution Control Board. p. 63. Retrieved 1 April 2011.